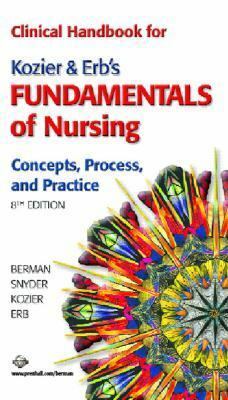 Fundamentals of Nursing, 8/Epresents the fundamentals of nursing care within the framework of the nursing process. This corresponding Clinical Handbook is the perfect companion resource to Kozier,Fundamentals of Nursing, 8 e/.It is ideal for quick reference or for use during clinical. An accessible writing style presents all the material essential for mastery.A Quick Reference unit provides a refresher of routinely encountered topics. Subsequent units are organized according to the steps of the nursing process providing the essentials of Assessment & Diagnosis, Planning & Implementation, and Documentation & Evaluation.For Nurses and Health Care ProfessionalsBerman, Audrey J. is the author of 'Clinical Handbook for Kozier & Erb's Fundamentals of Nursing, Eighth Edition Concepts, Process, and Practice', published 2007 under ISBN 9780131889330 and ISBN 0131889338. Loading marketplace prices 15 copies from $0.07 How does the rental process work?